Ginger and garlic in the broth and vegetables in the wontons put a healthy, warming twist on this classic soup. ANNOUNCEMENT: I cooked meat and not just bacon this time. Pork! Full fledged pork chops that I cut up and ground in the food processor. And it was delicious! But, don’t worry vegetarians, you can easily substitute the meat with 1 cup of veggie crumbles, mashed chick peas, tofu or crumbled seitan. The possibilities are endless! 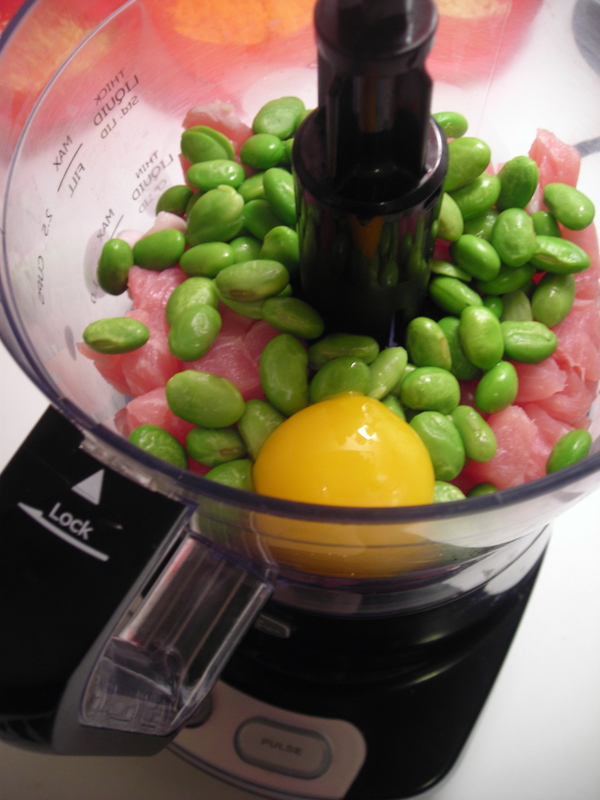 But it was so easy, I put the meat and edamame in the food processor with an egg yolk like this. Then I chopped it up like this. Then I made the wontons and boiled them in the broth four at a time and laid them out on parchment paper after. When the cooked wontons were finished, I spiced up the broth, ladled two cups into a bowl, plopped four wontons in, and nomz’d! I hope you enjoy this recipe as much as I did. The ginger really makes a good addition to the broth. It warmed me up just the way I wanted and gave me enough imaginary food medicine that I believe I won’t catch whatever everyone in my office seems to be succumbing to this week. *You may want to use cheese cloth to strain the broth at the end. I did because to me, wonton soup always has a crystal clear broth, but if you’re not picky, don’t worry about it. First you want to heat your broth so it’s ready and simmering when the wontons are ready to get dropped in. You also need the extra time for the ginger and garlic to release their flavor into the broth. Put the broth, water, garlic and ginger in a soup pot on high heat. Save the last two ingredients until the end, right before you serve it. Bring broth to a boil while preparing your filling and turn down to a simmer before you begin assembling the wontons. 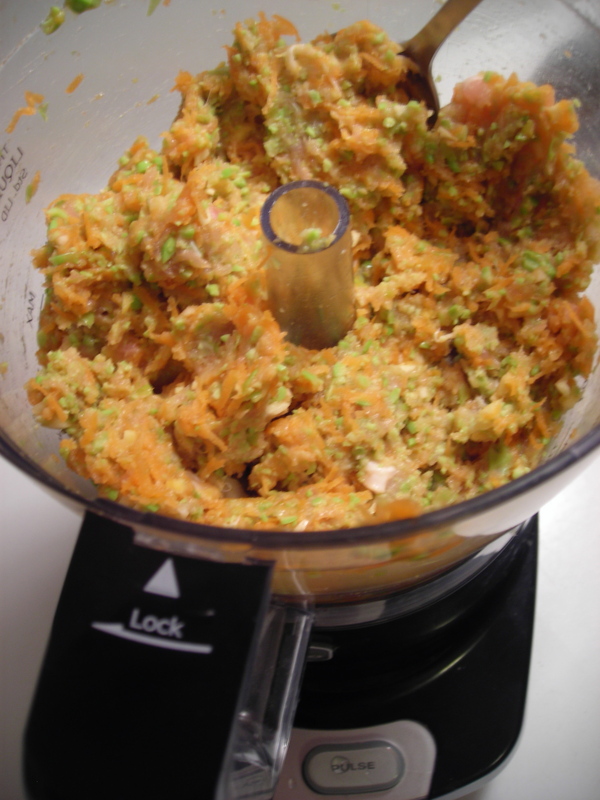 For the filling, dump the first four ingredients in a food processor and grind up. Then in a separate bowl or right in your food processor, stir in the remaining filler ingredients. Set aside and lay out your wontons, covered with plastic wrap or a moist paper towel, a small bowl of water and a cookie sheet covered in parchment paper. 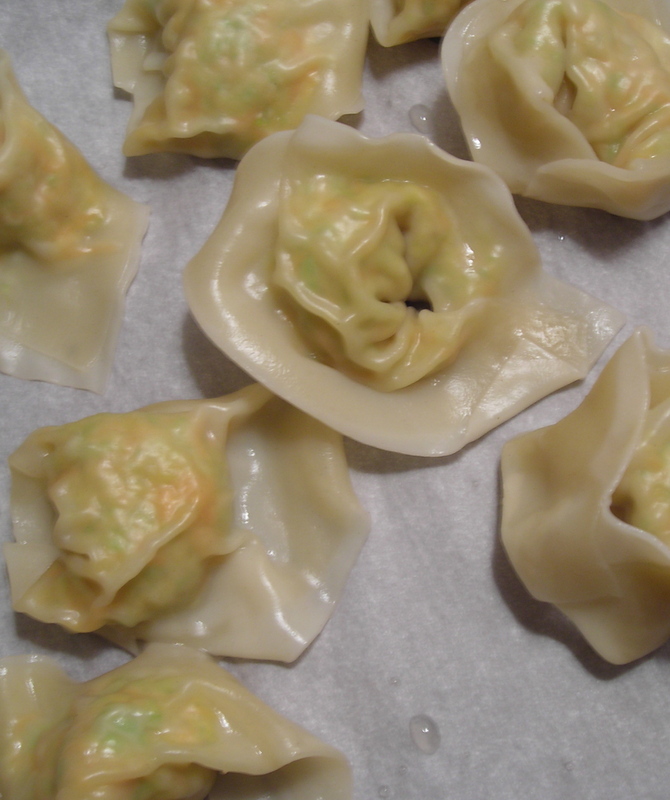 To assemble the wontons, drop one rounded table-spoon in the middle of the wonton wrapper. With your finger, spread water around the entire edge of the wonton wrapper — it’s like glue. Fold diagonally, forming a triangle. Pinch the edges together, then fold the two lower points of the triangle together making a little purse, viola! Repeat 16 times. After the first four are ready, dump them in the broth which should now be simmering. Make sure to have a slotted spoon ready. When the next four are ready to cook, the previous four should have floated to the top — that’s how you know they’re ready. When all the wontons are finished and laid out on the cookie sheet, use the slotted spoon to remove the ginger and garlic from the broth. Strain through cheese cloth, if desired, and return to heat. Add the shiitake broth, soy sauce and scallions. Let simmer for a minute or so. Then, ladle into bowls (about two cups in each bowl) add wontons and top with a dash of the hot sesame oil. It’s just divine, really! I’m totally going to make this one. LOVE wonton soup. 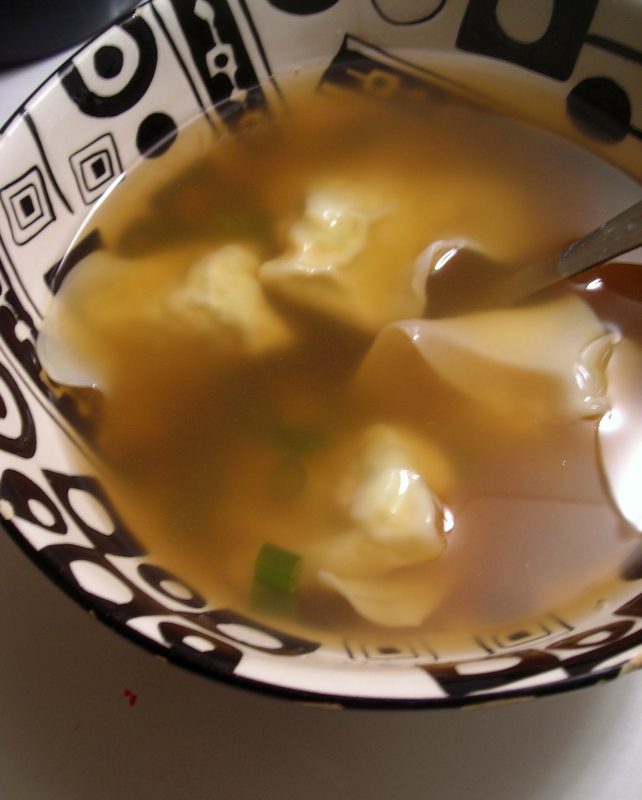 You are currently reading Wonton Soup at the soupbowl.